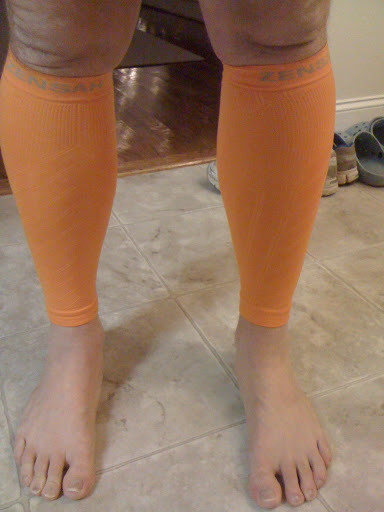 Back in Late November I contacted the good folks at Zensah to request a free pair of compression leg sleeves for a product review. Much to my surprise and delight, they responded quickly and sent pair of sleeves right away. I wasn’t able to test them right away, because I was sated to run a marathon the very week I received the sleeves. Then came recovery and rehab of a minor injury. BUT finally, in this new year I’ve run with the sleeves several times on long runs and short, tempo runs and easy runs. I don’t really understand the science behind compression. I mean, I get the whole stimulating blood flow and keeping the muscles warm, but beyond that, I really haven’t delved into the physiology of compression. Perhaps my friend at RunBlogger can explain the geeky side. I wore these today, under my tights, for a 12 mile run and was very pleased. My calves felt great through the run, and that is significant to me since I’ve been trying to transition from heel to mid-foot strike and to a more mid- to forefoot strike. So I expected some calf soreness over the last few weeks. I tried to alternate runs with and without the sleeves by way of a comparison and found that I like the way the sleeves “hug” the calves. And since it has been quite cold recently (sub-freezing temps when I run in the early morning) they’ve also provided a thin layer of extra warmth. While I don’t plan to run in my Sugoi compression socks that I reviewed a few weeks back, I like these sleeves for running, since they allow me to wear my own socks (Injinji, by the way). Of course, one can also use these sleeves for recovery and I did just that after the Rocket City Marathon in December and was pleased with the result. Another thing I like about Zensah is their presence on the web, and especially on Twitter. Zensah, along with Brooks Running, has been a regular and interacting presence on Twitter. Both have been engaged with their customers, answering questions, running contests. 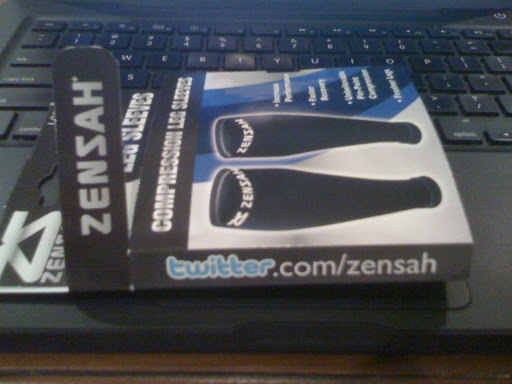 Zensah even goes so far as to put their Twitter address on the packaging, as you can see below. great review! I've been tempted to get some to try out. I LOVE my compression socks for post run recovery, but I don't want to run in the socks. I think these might be a good alternative! I was wondering about leg sleeves. THanks for the review! I love my Zensah leg sleeves!!! Highly recommended!!! Interesting…I've been looking at compression gear. Great to hear that you like the product and maybe I'll have to give them a try. Woo Hoo Baby ! ! I love mine. I actually feel I get more benefit from them AFTER runs than during, although running with them on long runs is great too. I'll even sleep in mine a couple of days a week. What about sizing? Which size did you get and how was the fit?